Leyla won the 2016 and 2017 National YoungArts Honorable Mention Awards! Leyla performed on Show 319 in San Jose, CA, on February 13, 2016. 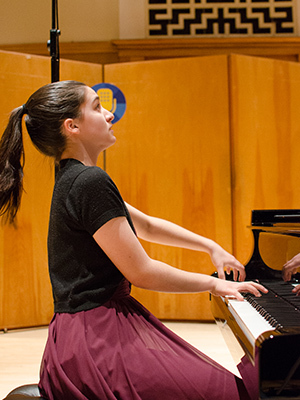 Leyla Kabuli (piano), 16, lives in Davis, California, where she is a junior at Davis High School. She studies piano with John McCarthy at the San Francisco Conservatory of Music Pre-College, and is the pianist of the San Francisco Symphony Youth Orchestra. She is a 2016 National YoungArts Award recipient, and has won top prizes in competitions including Virginia Waring International, Los Angeles Young Artists International, Enkor International, and Seattle International. She performed with Ensemble SF, and the Waring Orchestra. Leyla also plays bassoon and violin, and volunteers frequently as a performer at retirement homes and benefit events. She enjoys studying math, playing basketball, and traveling.